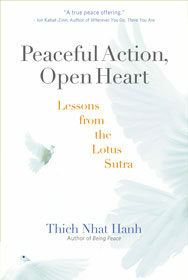 Zen Master Thich Nhat Hanh uses the Lotus Sutra, one of Mahayana Buddhism's most revered texts, to illustrate the Buddha nature inherent in everyone. With great passion and clarity, he demonstrates how each human being has the capacity to transform their individual suffering, develop compassion, and help create more peace in the world. Nhat Hanh's insights invoke a wide range of contemporary topics and concerns, from war and the threat of terrorism, to individual anxiety and the degradation of our environment. In proposing radical new solution to current conflicts, he encourages each of us to work on our own mindfulness practice to create greater peace and harmony. His thought and accessible reading of the sacred text demonstrates its practical and direct applicability to today's concerns.